First, when you Tune a Rune, Rarity and Stars have INDEPENDENT chances of improving on a Tune. What this means is that your level of Rarity won't affect your chances of rolling a higher star Rune or vice versa. As with the previous system, you can never Tune "down". That is, your next Tune will not be able to decrease Rarity or Stars. The visual blue bar is an indicator of RARITY bonus only. 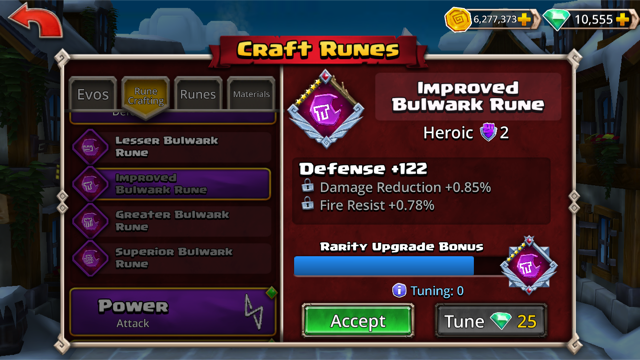 When you are about to Tune a Rune for the first time, your chances of Tuning a higher Rarity is the exact same as before the update. The visual bar is not filled at all and you have a 0% Rarity bonus. While there is no Rarity bonus applied, there's still a chance for a Rarity upgrade. As you continue to Tune a Rune, the blue Rarity bonus bar begins to fill up. This is a visual representation of the odds of you rolling a higher Rarity Rune. For example, if the blue bar is 50% full, you have a 50% chance of getting a higher Rarity on your next Tune. Similarly, if the bar is 75% full, you have a 75% chance of getting a higher Rarity on your next Tune. We hope that that clarifies things a bit. So if it's 0% full, you have a 0% chance of getting a higher Rarity on your next Tune? For example, if the blue bar is 50% full, you have a 50% bonus chance of getting a higher Rarity on your next Tune. Similarly, if the bar is 75% full, you have a 75% bonus chance of getting a higher Rarity on your next Tune. And the bonus is additive and not multiplicative? Joveth - you are saying that each roll on a 5* rare I had a massive chance to go to heroic? This doesn't sound even close to right. I tuned 35-40 times at 5* rare on 4 runes with no upgrade. All players who use runes think that as stars get higher you reduce our chance of getting rarity upgrade. Are you saying this is not correct? But of napkin maths on your statement puts a 12 roll early rare at considerably less than 1% chance on not going heroic. I think their "bonus" calculation isn't additive. I think it's a 0 to 100% bonus of the ORIGINAL upgrade likelihood, i.e. instead of 10%, you have a 20% chance. In other words, quite low and significantly less of a boost than the bar would seem to implicate. That bar is deceptive and worse than useless. It means nothing. It does nothing other than lead people on and get them to throw gems at a broken system thinking "It's almost full! I'm practically guaranteed an upgrade!" when in truth, the chance of getting bumped to Heroic or Legendary has only increased by a few percentage points. And I seriously don't buy that the two rolls aren't interconnected. Experience has shown otherwise. Even on the "tuning" stage of this guild games, the trash Lesser Resist rune bumped to 5* Rare on the first retune. Sure enough, seven rolls later, still 5* Rare. Can you confirm if the blue bar bonus works like this: Let's say going from rare -> heroic is a natural 15% chance on any tune. If the blue bar progress is half way full (50% full), the rarity upgrade bonus is 50% of the 15%, meaning your next tune will have a 15% + 7.5% = 22.5% chance of upgrading from rare -> heroic? The campaign quest is way harder to complete now. Before tuning you could reroll a rune a few times to a low cost. Any plans on that? Yeah, but Improved runes are really wasted runes once you're able to produce Greaters. I resented having to roll even the 3 red improved for 12/13 (or whatever) in the questline. Would have far preferred to do Greaters there. Hey folks, we got a small patch coming in very shortly that makes some adjustments to the Rune Tuning bonus to be more in alignment with the original post here. We're still working through feedback (including the concerns about upfront costs) and we'll continue to make adjustments as needed over the next few weeks. Thanks for your patience and we'll keep you posted on any additional changes! Have a happy holiday! Thanks for the notice! Looking forward to the new system. May hold onto my greater/superior mats for a bit if this is the case. The more transparent the better imo. I don't mind chance based gambling or low odds so much, but my inner nerd can't do meta-analysis without some knowledge of what the odds are. @Joveth Care to expand on what actually changed? I was under the impression that the explanation you provided on Nov. 21 regarding the Tuning system was referring to how the system was actually working in the game at the time of the post (and since the new system rolled out). Was this not the case? What has changed? What were the "small adjustments" made to better align the tuning system with your explanation? We wanted an explanation and clarity, these new stealth updates coupled with your ambiguous phrasing just further confuses me. I think @Renly has the right idea, maybe a bit softer approach would be better. @Joveth We'd love to hear more details about the small changes, would you be so kind as to give us some insight into what changed in the form of a patch notes post? Thanks in advance! We've slightly increased rates to match more closely with our initial explanation. End result is you should be seeing slightly higher success rates at getting Heroic & Legendary. I suspect that the original definition provided in the link below was how it was intended to work, but it didn't get implemented correctly. I posted in the link below that I thought rarity and stars were still linked and that high stars were lowering chances to get higher rarity on additional tunes. The response I got was that they were independent and working as intended, but I'm guessing they patched the game to correct the previous implementation but don't want to give us specifics. Stars and Rarity are still independent values from each other and have no impact. As explained, we've matched up rates to coincide closer to our initial statement (for example, 46% is now closer to 50%, etc). But as we've mentioned we are listening to feedback and we're continuing to make adjustments (which you'll hear about from us first). @joveth I realize the intention is for stars and rarity to be independent, but I don't think we necessarily believe it is working that way at the moment. I do appreciate your willingness to listen to feedback and make improvements, so thanks for that. As I said in a previous post, I think we just need to see a bit more data, then we can see if the real life results match up to what was intended in your original post. It would be helpful to know whether your last bullet is accurate, however, as it implies (as someone else already pointed out) that if the blue bar is at zero, then you have a zero chance at improvement, which obviously isn't the case. So if the bar is at 50%, is your chance to rarity improvement really 50% or is it 50% plus the base chance (maybe around 5%)? Not really. I rerolled some times only to get that reward. 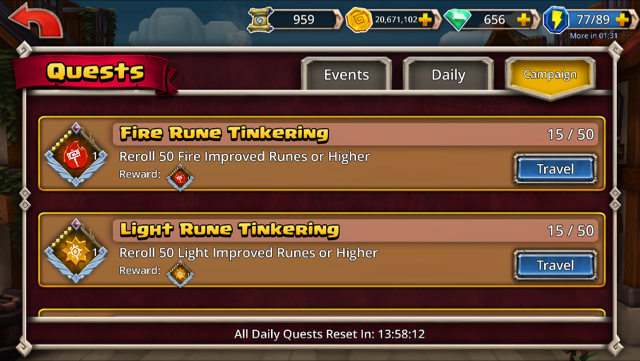 So before the patch you could reroll 1 rune for 5/10/35 gems. You could reroll 1 or 2 times and then do another one. Basicly, to reroll 5 runes 1 time did cost 25 gems. Same as 1 tune costs today. It depends though. If you had plenty of mats, then the old way was easier, but if you don't have as many mats, then the new system seems to be a little better. Many runes tuned. This is still not a good system. It costs more in the beginning. By 2-3 rolls i could see wich way it was going on old system. *stars, rarities, 2nd-3rd lines and passives. Not the case now. You just have to cross your fingers. And still! Stars and rarity impact improvement. You keep saying otherwise, but sorry. Numbers dont match. The bar. Seems to be pointless. As runes improve without it. And if its meant to be running into next improvement section. Well it doesnt. Im not a buyer. I have to earn gems. And to make a rare rune 4-5* after max rolls(new way). I have not made 1 rune of heroic or legendary since change. Not only is this new system a failure (my opinion ) but it is by a far margin. I think the bar misrepresents the data. I think that DB should make the bar represent the actual chance to upgrade the rune. If it's empty there's a 0% chance, full is 100%. The difference being that a rune will NEVER have an empty bar. When the rune tier improves the bar resets to it's 'default' value for the next level. IMO this would clear up quite a lot of the confusion around upgrade chances for runes. My rune tuning dice have been hot lately. I have gotten a Heroic most times and 4-5 stars as well. I rolled 3 or 4 in a row where I have a 5 star heroic with 6 or 7 tunes left. I think its the same system as before with just as much of a RNG that can help or hurt depending on how your dice turn up that day. I do think the bar never getting higher that 30-50% is very disheartening and the initial cost to find out the third stat is too high but I think DB is moving in the right direction, just need to polish a few things. I know they've said stars and rarity are independent, but I've never seen a 5 star rare move up. Yet I've seen 3 star rares go straight to legendary several times now. I feel like the moment I hit the first tune, I'm FORCED to keep tuning, otherwise all those gems are wasted. Only way to get any "value" out of the new system is to burn all the tunes and pray. All I know is, for us who are not maxed, and who do not have deep pockets, asking 25 gems for ONE tune for an improved rune is just not affordable. I dread to think what greaters and superiors will cost. I guess I will just play with suboptimal runes. I think whoever developed the rune costs has no idea how difficult it is for non-maxed characters to get gems - especially when the daily quests were toned back to give so few gems. The system appears designed to soak whales for gems and leave everyone else to fend for themselves. Can you clarify the last bullet point? I think a lot of folks are wanting to know this. According to your explanation, if the bar is not filled, then there is 0% chance that the rune will upgrade in rarity? So the only way to upgrade the rarity is to spend at least 2 tunes? Or does the blue bar mean that if by default there is an inherent chance of 10% that a rare rune will upgrade to a heroic, then a completely full bar will mean there is a 100% bonus to that 10%, meaning you now have 20%? Either way I think you guys need to change the system. It should be that on any given tune, regardless of the blue bar, there should be a default chance of upgrading a rune. Obviously as you go for higher rarity, that inherent default % is lowered. For example, going from Rare->Heroic should be like 15-20% chance per tune. Then as the blue bar fills up, it should add a set %, maybe 10% per increment. So if your bar is empty, and you have a rare rune, each tune has a natural 15%-20% chance to go up in rarity, and for each unsuccessful tune, you get an additive bonus of 10%. After 5 failed tunes, your 6th tune would be 15 or 20% + 60% = 75-80% chance that you will get a heroic. Please provide more clarity on how the blue bar affects the upgrade process and whether there are natural/inherent/default % of upgrading when the bar is at 0%. While there is no Rarity bonus applied, there's still a chance for a Rarity upgrade. - 4th bullet point, last sentence. Ah, good catch. Well that does explain one of my questions.